Groundwork is a huge topic. Starting with the question, what groundwork actually is. And depending on who you’re asking, answers will be extremely different. For some, groundwork covers mainly some basic handling. Others are including lunging and walking out in the terrain by it. Again, others are seeing horsemanship in it. All of that has it own importance. In academic art of riding, we want to go beyond. Already on the ground, we work with bending, stellning and framing. We would like to explain all secondary aids to the horse, work with side movements, collection and forward. We want to build up communication, but also do gymnastics. For starting academic groundwork, the horse should as well be at least 3,5 years. I personally prefer 4 years old before starting the bending work. If you think that is old, consider that a horse is growing until the age of 8. Traditionally, the young colts were started in between 4,5 and 5 years – when the stallion teeth had changed. If you are not surrounded by academic education, it might appear a bit strange to that humans are walking wackwards on the circle line for quite some time. But it has a very good reason: For you as a rider, it is an amazing tool to get a better overview and idea about biomechanics, movement and and a feel for your horse's body and well beeing. For the horse on the other side it is not only a wonderful tool to understand the rider's language, but as well to work on natural unstraightness, balance and strenghth. The ability of driving the inside hindleg forward is THE basic foundation for all dressage to come. And if the foundation is solid, you can start building up on it. What limits your dressage is always foundation problems, so better build it solid. Groundwork is like a couple dance. 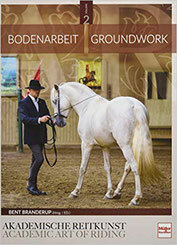 As groundwork is so complex, a good preparation and a good horsemanship before the bending work is essential. It is not only smart, but fun too to use the younger years of a youngster for building up exactly that: the work before bending and stellning. As long as a couple cannot walk together, using a caveson and trying to influence the horses spine and core stability is somehow off. If you like to have the fine tuning, get the rough outline first. Quite some horses experience it as a bit odd that suddenly a human stands in front of their nose and blocks their view. Therefore, before thinking about bending and stellning , teaching 3 basic positions before I start with more complicated stuff is simplifying your work a lot and therefore has a hugh impact. Keep in mind the fact, that learning something new takes around 1000 repeatitions, but re-learning something takes around 10.000 repeations. Find some inspiration about groundwork preparation here: Bodywork. I do prefer a pair of light leather reins at the length of 3,20 compared to a long lungeline. I like to use it with snaps as I sometime like to quickly switch positions during a session. But that is quite a bit of personal taste. Find out what you like to use yourself. If I know I stay in groundwork and lunging and there's no need for the snaps, I use a 4m cotton lunge. It's more important that the snap hanging on the nose of the horse is not so big it is irritation or, even worse, hurting the horse. First job in groundwork is to get in contact with the inside hindleg. The inside hindleg swinging in under the point of weight is the basic of lateral bending, carrying and therefore the natural gaits of a horse. Dressage is very easy. Control the inside hind and you have solved most of your problems. The rotation of spine and chest are responsible for clean basic gates and basicly influenced by the forward of the inside hind. And vice versa. The gluteus muscle of the horse's hind is connected to the lumbar spine, the control of the hindlegs under the point of weight is essential for the ability to work a horse over it's back. Nature is not straight. 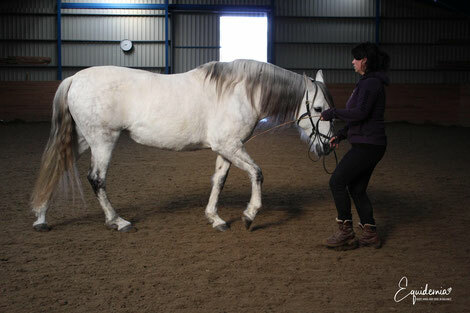 If your horse has problems to bend to one side, easy groundwork is a wonderful exercise to train straightening up. Even as a little 10 min warm up before rinding, jumping etc. it already can do a lot of good for your horses body. Stand in front of the horse's head. Best a little to the side, so the horse's view is not completly blocked. 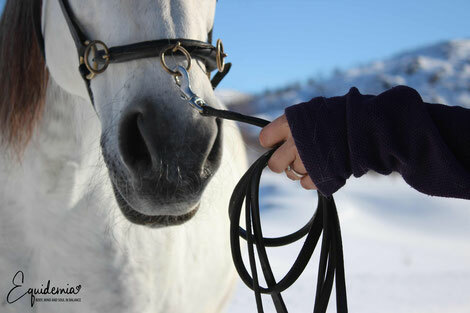 If it is to difficult and your horse continue to drift in or out, try to start with asking your horse to follow your navel. The whip works like a lengthening of your fingertip. 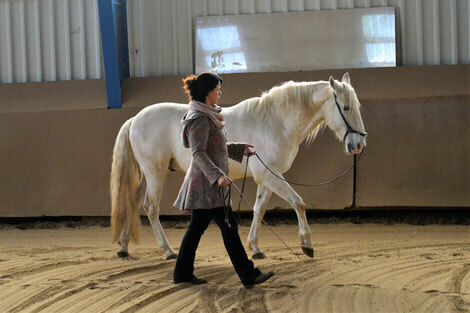 Imagine to stretch out your indexfinger and beeing able to reach the torso of the horse. Try to keep yourself on a BIG BIG BIG circle. The smaler the circle the more collection and bending is required. Keep it easy. Keep it big. Now focus on the moment the inside hindleg is leaving the ground. If your horse needs support to supple up and step under, touch the stomach of your horse with the whip on the inside for contracting the inside stomach muscles in the very moment of the hindleg is leaving the ground. That actually is already the first milestone in groundwork. If your horse is extremly stiff, it is very tempting to give a little "Zupferle" on the caveson. But really, groundwork is not about pulling on the head. It is about mastering the contact to the forward stepping hindlegs, placing the hip in the correct angle of power and therefore, the head is comming to your hand. Please be patient. What sounds so easy, and is explained in a couple of short sentences, is pretty difficult in real life, especially when you are a first doer. Don't be sad, that is normal. Walking backward in a good balance and tempo simply requires a lot of body control. Most people find their own unstraigthness as irritating as the unstraightness of the horse. Be prepared: There is one side on that it will be very difficult. It's neither your horses, nor your fault, and nobody here is naughty! You are just both unstraight. And that is absolutly natural and normal. Take care of your bodywork. Your inside shoulder, hip and toes point a little forward towards the horse. The more control you have over your body language, the easier it is to lead your horse. Lead with your point of weight. A super common fault is starting the horse by pulling on the head instead of inviting it to follow. But on the head, there's no hindfoot to be found that can carry. Don't pull on the head. And keep the circle big. Keep your circle big. Don't pull on the caveson. For orientation in the arena, it is very smart to put a cone in the center of your circle. Be aware of the fact that the positioning of the head is a result of the carrying of the hindlegs and the positioning of the hip. It would be very easy, but pulling on the head doesn't really help you to reach the muscles of hindquarter and stomach. Another reason often is a lack of balance. Don't worry - just do it. It's the repetition that leads to mastering. The more balance you find within yourself, the less support you need from your horse. Stretching, Yoga and Salsa helped me a lot for mastering my body control. Still, my horses are extremly grateful the more time I use training myself. Remember the picture of a dancing couple. If you do like dancing or not - but pretend to lead a precious lady on your arm to the dance flour, and show her of. That is a good feeling for starting groundwork. You enjoy groundwork? Dive deeper into groundwork topic and order the book. My collegues and me put together a beautiful book dedicated to groundwork on different education levels. You find the book in my online store and on Amazon. International shipping is possible.